Every day, Bay Area residents and visitors take more than 1.4 million trips on one of 27 different public transit operators. But for more than a decade, the costs to operate these transit systems have been increasing far faster than any improvements in service. Unless we make changes now, the system will not be sustainable in the future. Regionwide, transit carries one in ten people to work. 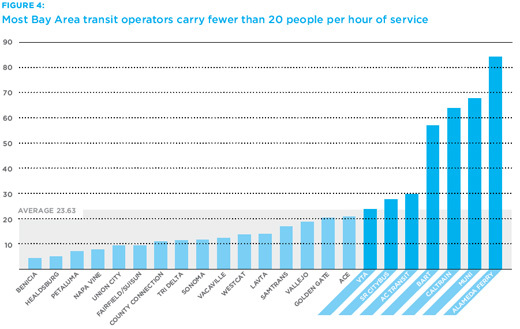 It costs more than $2.2 billion to run these 27 transit systems each year. More than $700 million comes from fares and $1.5 billion is a direct subsidy from a hodgepodge of sources (sales taxes, federal funds, state gas tax revenues). By looking out to 2035, these systems will face a combined $17 billion capital deficit and an $8 billion operating deficit. In recent years, the costs of running these transit systems have increased far faster than inflation, even as ridership on some bus systems has declined. About 14,000 people work full time for the region’s public transit systems. Wages and fringe benefits account for more than three-quarters of the operating and maintenance costs of transit, and the cost of fringe benefits in particular is rising fast. At the same time, budget shortfalls, unpredictable revenues and service cuts are degrading the quality of public transportation. Transit systems face competition from an underpriced alternative — driving — and often operate in low-density and auto-oriented environments that are not conducive to growing ridership. Unless there is some change to costs and revenues, with corresponding improvements in service, the viability of transit in the Bay Area is at risk. Recognizing this looming crisis, the Metropolitan Transportation Commission (MTC), the regional agency that funds transportation, launched the Transit Sustainability Project (TSP). SPUR interprets the key findings of the TSP report and offers six suggestions for how to save our transit system. What Does the Transit Sustainability Project Tell Us About Bay Area Transit? 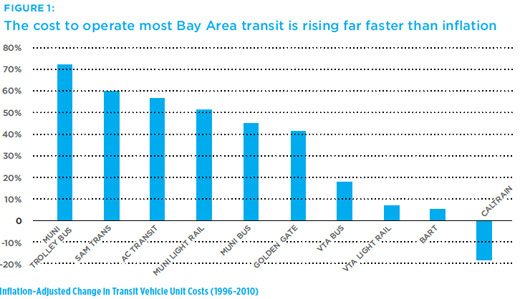 The TSP made four important findings about cost and service delivery of Bay Area transit. Issues of the organizational and institutional structure are addressed in a separate article on page 10. Unit costs — what it costs to operate a bus or train for one hour — are increasing at almost twice the rate of inflation for most operators (See Fig. 1). 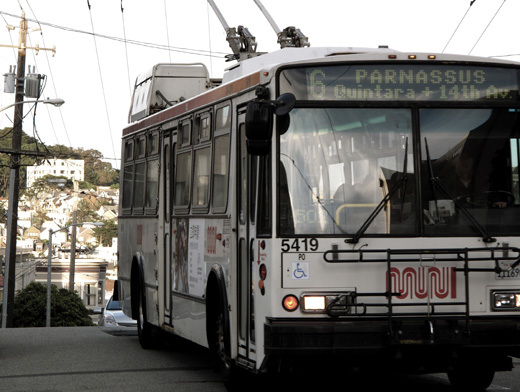 In the 14-year period from 1996 to 2010, Muni’s diesel bus unit costs increased from $92 to about $170 (an 86 percent increase). Over that time period, Muni’s trolley costs increased from $73 to $155 (a 111 percent increase). By way of comparison, the consumer price index (CPI)increased only 39 percent during this period. 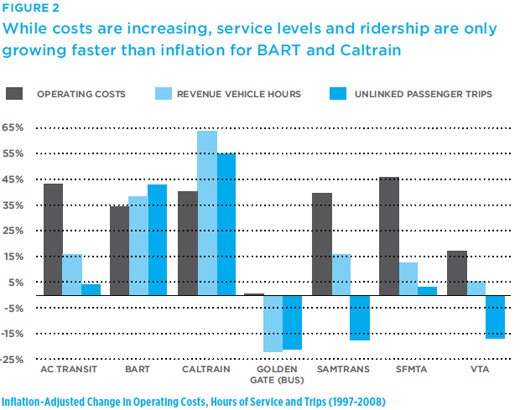 Among Bay Area transit operators, only Caltrain’s unit costs were lower (20 percent). Almost all of these unit cost increases are attributable to ineffective management. Among the most striking causes of cost increase are soaring pension and retirement costs, increases in health care premiums, and work rules that negatively affect productivity but do little to improve the working environment. If costs had grown in line with inflation, Muni would now have an extra $156 million per year, AC Transit $86 million and SamTrans $30 million. These savings equate to as much as one-fifth of the entire operating budget. There is no way to maintain a viable regional transit system without greater control of this cost inflation. While inflation increased by 39 percent from 1996 to 2010, unit costs (the cost to operate a transit vehicle for one hour) grew by more than double that for Muni, SamTrans, Golden Gate and AC Transit and faster than inflation for all other major transit operators except Caltrain. Increases in unit cost are not compensated by corresponding increases in productivity (measured in total passengers, passengers per hour or passengers per mile). In fact, in many cases — passengers per hour, for example — productivity has declined. The productivity trends also reflect real and difficult decisions facing agencies. For several agencies, the rise in costs and decline in ridership reflect policy decisions to continue very slow service in neighborhoods and put little priority on suburban arterials. Overall, this results in slower services carrying fewer people per hour of service. As the cost to provide an hour of service has increased, the number of miles that hour can deliver (and the number of trips a bus can make in a day) has declined. Traffic congestion results in either service decreases or more costly service. Among regional operators, Muni averages 8 miles per hour (8.6 for diesel buses and 6.6 for trolley coaches), AC Transit 10 miles per hour, SamTrans 12 and the Santa Clara Valley Transportation Authority (VTA) 14. Over the last 15 years, speeds have dropped about seven percent. If the Muni trolley coach system's average speed increased by just one mile per hour, Muni would save about $19 million dollars annually without any service decrease, just by making the buses go faster. If an entire bus route normally takes 40 minutes and slows to 44 minutes, it means a single operator can only make 10 one-way trips a day instead of 11. So in order to maintain the same level of service, the agency must put additional buses on the road, which increases costs. 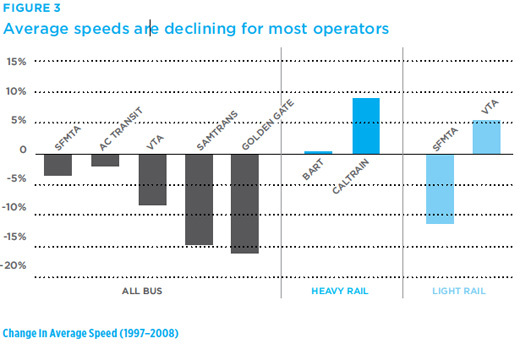 It will be difficult to either increase service or hold operating costs steady if transit speeds continue to slow. This chart shows the relationship between the total costs of running transit (operating costs) and the amount of service (revenue vehicle hours) and total riders (unlinked passenger trips). The overall trend reflects that ridership and service are not keeping pace with costs. Many parties are responsible for the inefficiency of local transit operations. Transit agencies have not done enough to control the rise in unit costs. Recent contract negotiations at AC Transit (and to a lesser extent Muni) reflect partial savings. But the agencies argue they are not likely to achieve such savings in the near term. Cities too often harm transit by not giving sufficient dedicated space in the streets for buses to operate efficiently. Finally, funding agencies select poor transit investments, which also harms transit efficiencies over time. Operating buses and light rail in mixed traffic means that traffic increases and congestion have very real impacts on transit speeds. And slower service means less service or significant increases in costs to maintain the same service. Having taken on a study of the issues with the TSP, the Metropolitan Transportation Commission should now take ownership over implementing many of the good ideas to come out of the process. The following suggestions show how to fix transit by improving funding, speeds, fares, competition, information and maps. Transit operations should be funded in ways that create an incentive for adding riders, as well as for making the most cost-effective improvements. For example, if the MTC offered to pay transit operators a $1 incentive (or bounty) per new rider, an agency that increased ridership by 1 million trips in a year would get an additional $1 million from the MTC. This would encourage transit operators to consider the immediate impact on ridership when allocating service. By shifting from a guaranteed funding stream to a bounty paid by the MTC, operators will have a direct financial incentive to increase ridership. Growing ridership is one of the key goals for improving Bay Area transit. When passengers transfer between BART or Caltrain and a local bus, they almost always pay two fares (there are a few exceptions, such as free transfers from Caltrain to Muni). In general, bus systems have little financial incentive to coordinate schedules with train systems. And the rail systems have no requirement to help pay for the local bus systems, even though they are getting additional riders and fares from these bus systems. This doesn’t make sense. The Bay Area needs a regional fare policy. This is complicated but certainly possible to implement with the Clipper Card as it is rolled out to all agencies. One approach would be for regional rail agencies like BART and Caltrain to pay a bounty to the local operators who deliver passengers to their systems. For example, if a passenger takes a local bus from Martinez to the Concord BART station, BART should share some of the paid fare with County Connection, the local operator. The end result could be better service to passengers, because the local agencies will benefit if they do the right thing — like coordinate schedules, adopt reasonable transfer tariffs and extend their hours of service. Improving transit speed and service requires investments in things like dedicated lanes for buses, signal priority and other operational improvements. When streets are designed for auto speeds, transit suffers and costs go up. MTC is already proposing a new $30 million pilot program for prioritizing transit on existing city streets to speed service. This annual program is a good start and should be expanded. Just as we have a legislative analyst in Sacramento and San Francisco, we need an independent transit analysis office to both improve the public’s comprehension of the challenges facing transit systems and provide transit operators with clearer information on how and where their particular system should improve. There is already a lot of transit information out there. But there is no office with tenure and structural independence whose sole focus is to track transit performance and provide objective input to transit boards throughout the region. The Bay Area has over 4,400 transit vehicles. Over 3,000 (68%) of them are buses, making this mode the workhorse for transit in the region. While merging many of the Bay Area’s transit systems is impractical and not likely to achieve significant cost savings, making the entire region feel more like a single system could achieve many of the same results. The Clipper card is one step in the right direction. Creating a single transit map for the region would be another. A further step would be to move toward common marketing and branding. This approach has been taken in Melbourne, Australia, where there are numerous transit operators but the public face of transit is a single brand: Metlink. Bay Area transit systems, while operated separately, are owned by the same shareholders: the people. That simple fact should make improving transit for its owners (i.e., its customers) a top priority. To get the Bay Area’s $1.5 billion in annual transit system investments to produce better results requires much more transparency and direct and accountable financial incentives. These are not revolutionary concepts — in fact, they are the basis of all democratic systems. The system will not get better on its own. It will start to unravel unless we make needed changes. A better and sustainable transit system for the region will make a better Bay Area. Egon Terplan is SPUR's regional planning director.